This past Sunday I was back at Sojourn Kids, teaching about Moses, which I’ll get to in just a moment. First, however, I wanted to link to this post that Heather wrote on her blog about visiting Sojourn while the boys and I were in the kids groups. She did a good job at capturing that my “journey” series is about; the experience of visiting a new church and exploring what makes it unique. Now — like I said, while she was there, the boys and I were at Sojourn Kids. The lesson was about Moses, covering from burning bush and the plagues. I prepared by reviewing the lesson materials and the scripture and some Moses mood music — The Plagues from Prince of Egypt, a “Let My People Go” bit that in my opinion rivals the Charlton Heston bit. It’s hard for me to say for sure, but it felt like one of my better performances teaching at Sojourn Kids. Aided by some great acoustics, I did a pretty decent retelling of the story. The crossing of the Red Sea wasn’t part of the lesson, but the kids wanted to hear that part and the Passover, so I added those in. My Red Sea crossing, and the encore performance the kids asked for, got applause. It felt like a week that I made good use of everything I brought to the table, from understanding of scripture to improv acting skills. I’m biased, but I feel like I’ve made some progress over the past year. So that complicates the decision as to whether to continue or not. I’ve been doing this for a year, and so it’s sort of a logical time to move on. I started doing it on an open-ended basis, but didn’t think it would be permanent. To be honest, I really believed I would be so bad at it they would have asked me to stop by now, but was willing to “put my ‘yes’ on the table,” as Heather would say, and be used if called to serve. I plan to start going to church with Heather and the boys more, so that’s a factor; the boys like hearing me teach, so that’s a factor; but they also don’t like going back and forth, so that’s a counter-factor to the last factor. There are also some changes in Sojourn Kids leadership coming, and I think that may be the deciding factor; while I like the new people, I started as largely a personal favor to the outgoing leader, so that makes this a logical time to move on. I wouldn’t teach again until next month, so I may have a little time to decide, but I think that may have been my last lesson. It was sort of an appropriate lesson for dealing with that; it’s easy to forget just how reluctant and resistant Moses was when God called him to service at the burning bush. I’m nowhere near that set on quitting this, so if He wants me to keep going, I’m sure He’ll let me know. With Christmas approaching, the lesson I taught the kids this past Sunday at Sojourn was about joy, in honor of the third week of advent, and about Gabriel appearing to Mary, and about the fact that, with God, all things are possible. Heather’s boys, Finn and Caden, came to hear me teach for the first time this past Sunday, and that was really cool. I think it may even make me better at doing this. When I started doing Sojourn Kids storytelling, I struggled with being able to read my audience. Doing improv or giving lectures, I’m pretty decent at reading the audience and reacting accordingly. When I started working with kids, it was like a blank wall; I couldn’t read them, so I couldn’t tailor what I was doing. The boys have given me a better feel for that, and having them there Sunday was a great metric. Renae, the Sojourn Kids leader, commented that she thought I’d really been doing better lately as well. But, getting back to the actual lesson, there were some entertaining parts, like when one of the kids and one of the teachers acted out Gabriel’s appearance to Mary — angels run around in circles more than I would have expected — but, for me, the biggest take-away was in the part about how all things are possible with God. 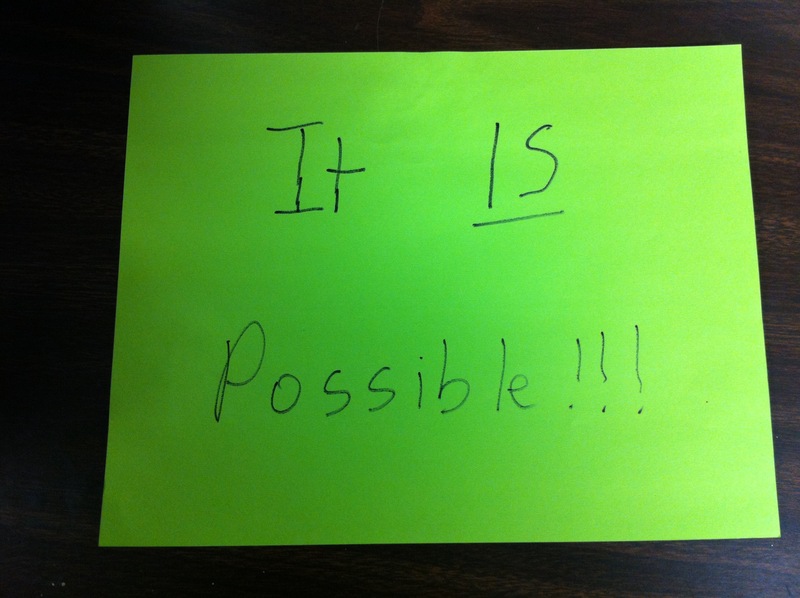 To help engage the kids, I made signs saying “It’s Not Possible” and “It IS Possible” and then asked the kids if different things were possible or impossible. I started with general stuff, and ended up asking whether they thought it was possible or not for me to do certain things, picking some unlikely-sounding examples, like floating in mid-air. Almost all of the kids picked “not possible,” even though they were all things that I’ve actually done. I used it to make the point that we can do things that we may thing are impossible. But it drove home just how blessed I am; how many things that seem, particularly when you try to explain them to little kids, like they should be impossible that I have had the opportunity to do. God’s let me do some awesome stuff, and it’s easy to overlook how blessed I am. And, in part, it gets back to what I wrote last week about children’s perspectives — they help us see how amazing things are that we take for granted. How about you? What things that a pre-schooler would think are impossible have you had the chance to do? So, Sunday, I was teaching kids at Sojourn again. I’d studied my lesson on John the Baptist and was really feeling pretty good about it. Unfortunately, when I got to church, I discovered that I had accidentally downloaded the wrong materials and that I was, in fact, actually supposed to be teaching about Gideon. Whoops. So I quickly reviewed the materials about Gideon, and was able to successfully tell a decently engaging story about him, instead. Which was a shame, because I was really looking forward to doing the quiz provided in the materials about eating bugs. — It surprises me sometimes how much my Bible literacy has increased, or at least how much it feels like it has. I was able to switch gears so quickly in part because I was moderately comfortable with both stories, enough that I was able to brush up adequately just in looking over what points they wanted made from the story. I’m not really sure what’s changed, but I credit it in part to a change in how I think about the Bible. I was raised with the impression that the Bible was a collection of verses that you were supposed to memorize, a task that was rather daunting and really not particular compatible with my skill set. I always felt like I didn’t “know the Bible” because there weren’t enough verses and chapter and verse citations that I could rattle off. Over the past couple of years, I’ve changed to thinking more about the Bible as an anthology of related and interconnected stories, and focus less on memorizing the verses than knowing the stories. It’s made the book as a whole make a lot more sense to me, and made it much more accessible to use. — I was a little glad not to be teaching about John the Baptist. I commented ahead of time that I was going to have to make a real effort to behave. That’s another thing that’s changed in the past couple of years about how I access the Bible, is I’ve tried to work to have a better understanding of cultural context for the stories. And the story of John the Baptist develops some interesting ramifications when you look at it in a Jewish rabbinical yoke context. A big part of the guy’s ministry is saying, “Hey, look, you don’t have to do ‘religion’ they way you’ve been taught you have to. I’m not in the temple. You don’t have to be, either. You don’t have to go to ordained ministers to learn about God. God’s bigger than all of that that.” But that’s probably not what they were wanting me to teach the kids. — Gideon, on the other hand, was just fun. I’ve had the opportunity to tell stories to kids much more frequently lately, and I felt like that came through for me during the story I told Sunday morning; I felt like my actual delivery was better. I’ve talked in the last few Sojourn posts about feeling like I was struggling to keep the kids engaged and focused. Sunday, i didn’t feel that way at all. And that was nice. — We studied John the Baptist in my Journey Group recently, so he was fresh on my mind. My most recent interaction with Gideon, on the other hand, was in fleeces. The angel appears to Gideon, who’s like the most unlikely action hero ever, and tells him he’s going to lead an army into battle against the rather daunting Midianites, and he’s going to win. And Gideon goes home, and says, “Hey, God, look, um, before we do this thing, I want to make sure that was, like, a real angel and all, so, if you wouldn’t mind, I’m going to put a wool rug out, and when I wake up tomorrow, would you be so kind as to have the ground be dry and the fleece be wet?” So he goes to sleep, and wakes up, and sure enough, dry ground, wet fleece. So that night, he says, “OK, God, thanks for the wet fleece and all, and, see, it’s not that I don’t believe, it’s just that I’m not really sure that I believe, you know? So if we could maybe make sure that last night wasn’t some sort of super-absorbant fleece abnormality, I would really appreciate it. So maybe could we do it again, only reversed? You know, wet ground, dry fleece?” So he goes to sleep, and wakes up, and, sure enough, wet ground, dry fleece. And so after some exciting stuff about God telling him his army’s too big and people drinking water the wrong way and trumpets and torches in jars and stuff, sure, enough, badda bing badda boom, Midianites are gone. And it’s something Christians like to latch onto, this putting out our fleece bit. I did it earlier this year, and still have no clue what to make of it. I hoped I’d get some great insight from the lesson in that respect, but, really, not so much. How about you? Any thoughts on putting out fleeces? Have you done it? How’d it turn out? Another Sunday teaching kids at Sojourn. This week, the lesson was about respect. It was interesting timing; I came out of last week annoyed and frustrated at the lack of respect that a small number of the kids had shown to me and their peers during the lesson. Frankly, I really didn’t want to have to teach this particular lesson to that particular group; it seemed very much like a case of casting pearls before swine. As it turned out, those kids weren’t there anyway. It was a much smaller group, and pretty much the opposite of the class from the month before — rather than being too disruptive, they were too quiet; it was hard to get answers to questions initially (though they eventually warmed up a bit). The lesson was out of Matthew 8. 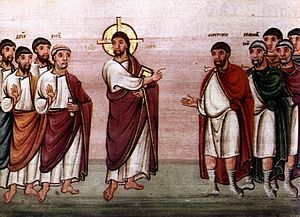 A Roman centurion comes up to Jesus and tells him his servant is sick. Jesus says, “No problem, I’ll go heal him.” And the centurion says, “Dude, you don’t have to do that. I know you can just give the word, and he’ll be better.” The centurion explains that, being an officer over large group of soldiers, he gets the idea of authority. All he has to do is give the order, and what he orders will be done. He gets that Jesus has an even greater version of that sort of authority. “You give the order, Jesus, and it’s done.” Jesus is all impressed, saying that in all of Israel He’s never met anybody with faith like that. He tells the centurion he can go home, that He’s healed the servant like he asked. It’s a cool story. I like the stories were somebody gets it. The stories where Jesus is happy, the ones where, without it being written, you know He’s grinning. I’ve written before that I think there are a lot more of these than we acknowledge; tone of voice can completely change the meaning of the same words. I think people tend to read Jesus as dour when there was actually a grin on His face or a sparkle in His eyes. I think Jesus had a huge smile when Peter fell in the water and Jesus called him “ye of little faith.” But all of that’s beside the point. There’s no question Jesus was proud of this guy for getting it. The lesson was about respect, and we talked about that. For the centurion, life was about authority. 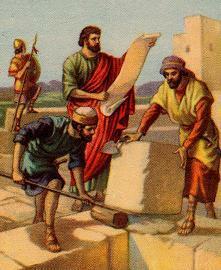 If he had a problem, he gave the order for it to be resolved. If he couldn’t, he went up the ladder to someone who could. If he lacked the authority, he would go to someone with more authority. He expected respect from those with less authority; he gave it to people with more authority. Jesus had authority to do something he couldn’t, so he respected Him. The kids and I talked about ways they could show respect to God. But the authority part of it is fascinating, too. The centurion had authority over life or death. At his word, he could cause someone to die. Conversely, he could allow someone to continue to live. He got that as Proverbs 18:21 says, “the tongue has the power of life and death.” He had no reason not to believe that Jesus could order healing for the servant. We fail with that sometimes. We believe in the theory of an omnipotent God, but we have trouble with the reality of it. We have trouble with the fact that a God who could do everything could do anything. What can your God do? I guess there are a couple of different directions I could go with this post about this past Sunday. I could talk about the lesson that I taught the kids at Sojourn. Or I could talk about the experience of teaching the kids. The lesson was about forgiveness, and was rooted in the story of Jacob and Esau. It started much later in the story than people often do, not with Esau selling Jacob his birthright for a bowl of stew, or with Jacob tricking Isaac to receive his blessing, but with Jacob deciding to return home after fleeing his brother’s wrath. 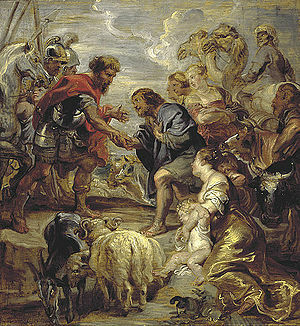 The story was about Esau’s willingness to forgive Jacob, and encouraged kids to have the same attitude of forgiveness. But I was more intrigued by the part we didn’t talk about. Esau’s apparently short-sightedness, to sell his birthright, to sell his future fortune for a bowl of stew. The curriculum used the term “birthright and blessing.” And as easy as it is to criticize Esau for that, I wonder how often we do that ourselves; how often we exchange a blessing that God has planned for us down the right for something much less in value but much more immediate. And how many times do we not even have to sell our blessings? How many times do we not even get the benefit of trading them for something of lesser value, because we are afraid to claim them? Because we don’t trust that what God has planned for us is really worth having, and don’t pursue it? Or because we let fear prevent us from accepting his gifts? That said, throwing a complete monkey wrench in that thought process is this — When Jacob was returning home, he was afraid that Esau was still mad at him, possibly still murderously so. So he sent peace offerings, animals from his herds, in hopes of winning Esau’s favor and forgiveness. When Jacob finally arrived, however, Esau returned the gifts. Because he didn’t need them. Esau was doing just fine. Even having sold his birthright and blessing, he had amassed enough on his own that he had no need for his brother’s gifts. Maybe he didn’t have as much as he would have, or maybe he did. But either way, he had enough. And he got the stew. I would love for someone wiser than I to tell me the message we’re supposed to learn from that. OK, that’s the content part of it. The presentation part? This Sunday was one of the hardest I’ve had in months. The kids had no interest in paying attention. And I don’t entirely know why. I don’t know what I did differently, or what I should have done differently. I know that there was one kid in particular who was so disruptive that he disrupted it for everybody. But I have no idea what I should have done about it. Sigh. Next week — I think I’m going to be at Southside Baptist. Barring anything changing between now and Sunday. Which is entirely possible. My church doesn’t have Awana. But we do have Missional Communities. Does your church have Awana? Does that even mean anything to you? If you’ve been to a large enough church of certain denominations, you know exactly what I’m talking about. If you’re not active in one of those churches, you probably have no clue. Because it’s a bit unclear, isn’t it? What is an Awana, exactly? The word means nothing at all, unless you know what the word means. For some reason, it makes me picture an exotic Oceaniac bird, but that probably doesn’t help, does it? Awana is an international, multidenominational evangelism and discipleship program for ages 2 to 18. The Awana organization established the program, and individual churches have Awana groups for kids. Awana, by the way, is inspired by 2 Timothy 2:15, and stands for “Approved Workmen Are Not Ashamed.” Obviously, right? But how do you convey that to other people? Things like Awana make the church exclusive, arcane. A church can put on its sign when Awana groups are held. And if you’re a member of the church community, if you’re in the know, then that means something to you. But if you’re not, it means nothing. At that point, the church might as well be speaking in code to keep outsiders clueless. Which, one could argue, somewhat defeats a big part of the purpose of the church, right? And that feeds a perception that people have that the church is exclusive and arcane. It makes people feel less welcome, more different, less connected. Which is the exact opposite of what we should be trying to accomplish. I don’t know that it really matters; I don’t know that one term is better than the other. And, to be fair, Sunday School is sort of a mixed bag. It’s a term that has been around long enough for people to know what it means. On the other hand … well, it’s a term that has been around long enough for people to know what it means. It’s recognized and understood, but probably has negative connotations to some people outside the church. If I invite you to Sunday School, you may know what I’m talking about, but you may not want to come. Life Group, on the other hand, means less. Not only because it’s less well-known and universally understood, but because there’s less universal meaning. I’ve seen Life Groups as Sunday morning programs and as Sunday evening programs, and they may be held in even more contexts. I’ve been a Baptist for a while, but I’m not necessarily going to know what you mean if you invite me to your Life Group. But that, at least, means it doesn’t carry any negative connotations. This topic was an issue for me during a recent discussion at my primary congregation, Sojourn. Small group meetings at Sojourn are not held at a uniform place or time, but, rather, at homes around the area on different nights throughout the week. The small groups are called Journey Groups, echoing the Sojourn name and reflecting the idea that the church is a fellowship of believers sharing their journeys through life together. I’ll admit that it’s a non-literal name, but, to me, it’s accessible, intriguing and appropriate. I’ve had no problem telling people that I was going to Journey Group, and then, if necessary, explaining what that is, and why we call it that. For the new year of groups, however, the church leadership decided that the name should be changed to Missional Communities, or Missional Community Groups. After the annoucnement, there was enough protest from within the church that the Journey Group branding was kept for public use, although Missional Communities will be used internally. I think the reversal was the right decision. Ironically, Missional Communities is a bit more descriptive, especially if you know the jargon. I know what “community” means, especially within the context of a church and particularly Sojourn. I understand the concept of “missional,” even if the particular details of the mission can be arcane at times. I question whether even within Sojourn every regular attender of a Missional Community could tell you exactly what the mission is. But to an outsider? Is someone not involved in the church going to know what a Missional Community is? Heck, is someone involved in another church going to know what a Missional Community is? Are they going to want to be part of one? Or are they going to be excluded by the name? Is a non-believer going to take it as one more piece of evidence that they just don’t get this whole Christian thing, you know? To me, it’s religious in the worst sense of the word. It’s formal and bureaucratic. It sets apart the insiders and the outsiders. It’s the sort of thing the pharisees would be proud of and the prostitutes and tax-collectors would have no interest in. Sojourn’s website still boasts the slogan “rethink church.” But as time goes by, there seems to be less rethinking. A good friend of mine argues that the modern church is inevitable. That no matter how much tradition you strip away, how much you return to the basics of the Biblical church, a body of believers in this day and age gradually drifts back toward the mainstream of the modern church. Sometimes, I fear she’s right. I applaud Sojourn’s leadership for making that drift seem a little less inevitable.